Hello, I'm excited to share press release information below about my upcoming exhibit and opening reception. Please come on by February 24th from 5-7pm and say hello!! 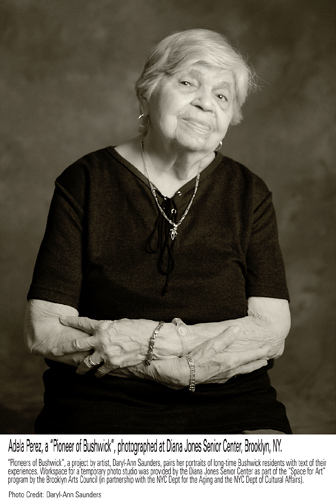 Pioneers of Bushwick: We Call It Home is an exhibit featuring photographic portraits of long-time Bushwick residents by Daryl-Ann Saunders, presented at the Diana H. Jones Senior Center, located at 9 Noll Street between Bushwick Avenue and Stanwix Street in the Bushwick neighborhood of Brooklyn, NY 11206. Through Space for Art, a city art residency program matching artists to city senior centers with workspace, Daryl-Ann Saunders created a small “pop-up” photo studio at the center. There she began creating studio portraits and collecting written text of Bushwick residents that have lived in the neighborhood since the 1970s and still live in Bushwick today. Many center members are included in this collaborative effort. Ms. Saunders is a professional and fine art photographer. Her images have been published worldwide, is exhibited regularly and held in the collections of Pfizer, Inc., General Electric as well as other collections, public and private. For more information about the artist and her projects, visit: www.DASfineart.com and www.PioneersOfBushwick.com. Project/ exhibit space, senior participation and staff support has been generously donated to the Pioneers of Bushwick project by Diana H. Jones Senior Center and their sponsor, RidgewoodBushwick Senior Citizens Council. The organization seeks to promote the well-being of community residents who are 60+ years of age through nutrition, recreation, social services and educational programs. This exhibit is sponsored, in part, by the Greater New York Arts Development Fund of the New York City Department of Cultural Affairs, administered by the Brooklyn Arts Council, Inc.(BAC). The Space for Art program (now SPARC) was initiated by the Brooklyn Arts Council in partnership with New York City Department for the Aging and the Department of Cultural Affairs.